Has your website traffic inexplicably dropped and you have no idea why or how to fix it? A traffic drop can be a scary thing because it often goes hand-in-hand with a revenue decline. If you’re reliant on organic traffic for a large percentage of your business, then this can sometimes mean a strain on your business that leads to other uncomfortable realities like layoffs. If you’ve experienced this, we want to help you get your business back on track. It takes effort and investment, but be assured that it is possible. Assuming there is actually a traffic drop, consider engaging with a professional (maybe an SEO site audit) to fully diagnose the cause of the drop and create a gameplan for recovering. 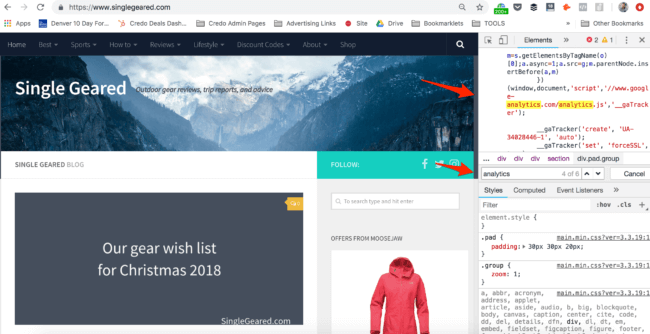 This post is going to cover what you, the website owner or marketer, should do to investigate the drop on your own before contacting someone to pay them to help you get that traffic back. These steps are the beginning of what a professional that you hire will do anyways, so you can save yourself some time, heartache, and money by having as many of the answers as possible before you start. The Google Analytics drop alerts start arriving in your inbox. The rank trackers say your rankings went down. Friends start asking how to find your article about blue widgets. Some asks you if you saw a drop in traffic on Twitter. That sinking feeling becomes stronger. Did you lose traffic? Did something happen on the internet that is going to negatively affect your business? You lost your GA tracking code on your site. 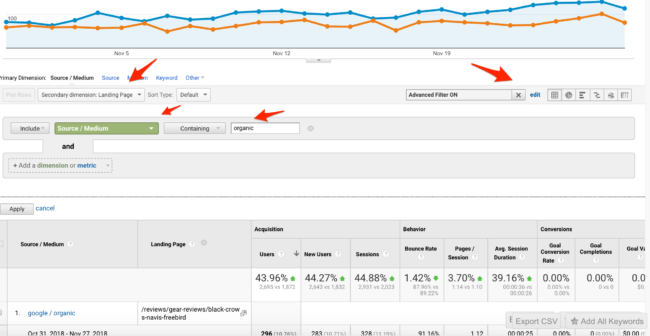 First, check your overall traffic graph against the previous 30 days. Did it go down? If it didn’t go down, then you’re probably ok. Your rank tracking software may have a bug or something misfired to “alert” you of an issue. If it did, then keep going. Did organic traffic go down? If not, then something else has happened. If so, then you may have a problem on your hands. 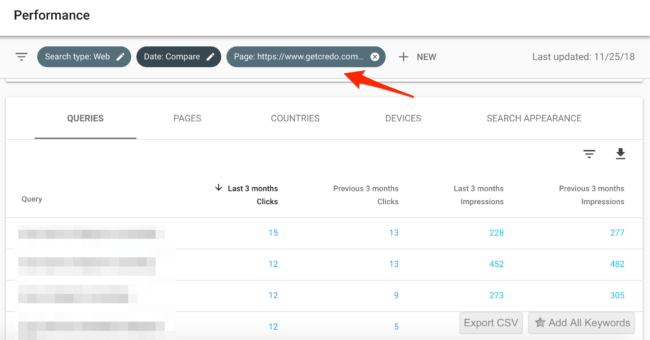 Before you freak out, then calm down, then put in place a strategy for figuring out how to get it back, you need to make sure that everything you need is still in place, specifically your Google Analytics tracking code. Pro tip: use a tool like Little Warden to alert you to changes like this before they cause you a heart attack. But do know that sometimes, when your visibility goes down, you haven’t necessarily stopped ranking for keywords that actually matter to your business. But it wasn’t so. They lost “visibility” for keywords that didn’t drive them much traffic or users. The reality was that no, we did not lose traffic but rather our rankings for some branded terms (that we share with some very big multinationals) shifted and thus we “lost” visibility that we never really had anyways. Sometimes, things are not what they seem. If you’ve identified that yes, you did indeed lose traffic now you can dig into where that happened. Digital marketing tool of choice for keyword movements. 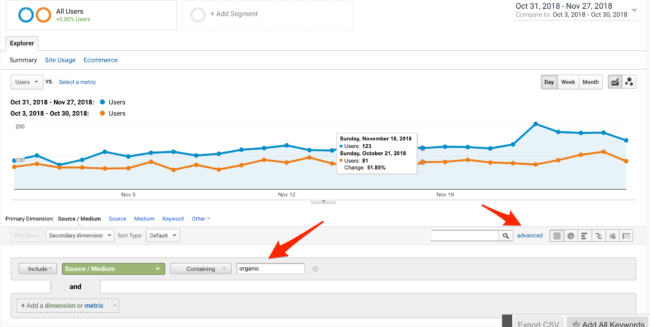 As you probably know, Google Analytics no longer shows keywords because of “privacy”. In reality they haven’t really had any useful keyword data in GA since about mid-2012, so it’s been a while. But you can use GA to identify the landing pages that lost traffic from organic. If it’s just a few pages, then note them down to zoom in within Search Console. If it’s more, then you can download your Analytics data to a spreadsheet (or a Google Sheet) to keep track of them all. Now, I am going to show you how to do this on a relatively small site. A larger site can require some data manipulation within Excel or similar to identify issues. But this is a good first check for any size of site especially if you lost a lot of traffic, because you can identify if it was a lot of keywords that lost traffic/visibility or just a few that you can focus on. 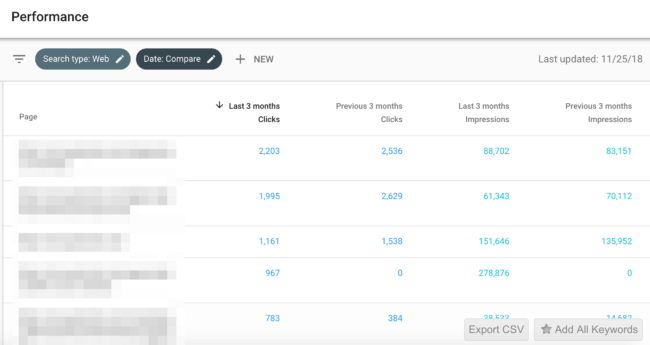 If a page has gone down, you can click into that to see the queries that reduced in impressions and clicks. In this case, none of the queries are getting a ton of clicks, but it is relevant traffic. Now when you scroll down the page, you can see each individual page. Click the Date Range (Compare in the screenshot below) to adjust what you want to compare. For more granular traffic drop analysis, make it week over week. Since you’re doing SEO, you should have rank tracking set up so that you are given at least weekly, if not daily, reports on your rankings. Individual rankings are never a KPI that I target when working with clients or on my specific site, but if you’re not tracking your rankings then you’re definitely flying a bit blind and it can make reverse engineering incident as like traffic drops a lot harder (though less so now with tools like SEMrush and Ahrefs that have big keyword databases). If your traffic dropped, check your rankings. Simple as that. Did they go down? Which ones? Within any of the popular tools, you can set up a project and track your keywords within categories as well. By adjusting date ranges, you can get a broader view into your shifts. 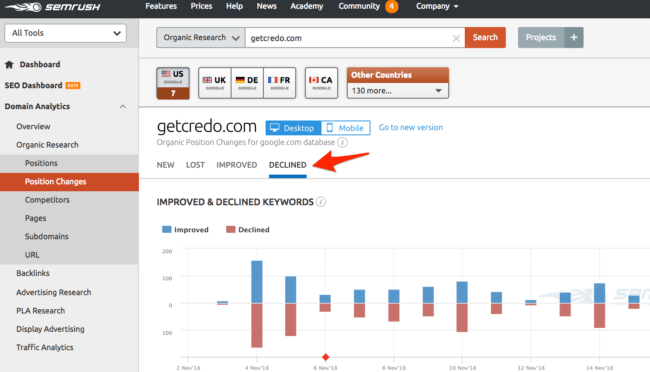 If you don’t have rank tracking set up like above, you can still use SEMrush (or similar) to see movements in keywords. Did my traffic actually go down? Which buckets of keywords lost visibility? Did they actually lose traffic-driving visibility or is there just volatility in lower (non page 1) rankings? Now you need to investigate the root cause. There are many, many, many, many reasons why organic traffic might drop on a site. Did something change on the site to make this happen (changing URLs, etc)? If so, was it actually a drop or did a URL look like it stopped driving traffic when it actually is just a new URL now? Did an algorithm change roll out? 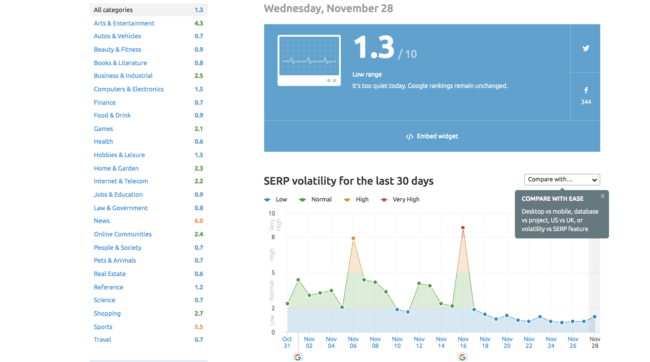 Check Moz’s Algorithm Change History and SEMrush’s Sensor. What about competitors? Did they do something that improved their rankings and therefore knocked yours down? There are many more that you can investigate, but these are where we always start to diagnose what might have changed. Normally, it’s something that changed on your site and thus your rankings changed. Sometimes it’s an algorithm change, but in my opinion people are way too quick to say it was an algorithm change without actually digging into their website. If your traffic dropped, then you need a gameplan to get it back. Playing ostrich and sticking your head in the sand isn’t going to cut it here. This is business at hand. Your gameplan will be comprehensive, and sometimes it will have some hypotheses and conjecture as well. Add Schema markup back the pages and get the search engines to recrawl them. I always like to start with the problem, go to the strategy, and then rank in order the things that I think will be the most impactful and most likely to get the traffic back the fastest. Tools like Little Warden for monitoring things changing on your site and SanityCheck for daily reports on Search Console changes. All of this tracking will help you monitor the health of your site and start identifying issues before they become a huge issue that results in traffic dropping. What about you? What do you look at or where do you go to diagnose a traffic drop? That was a brilliant read, John. I think it happened to all of us, marketers, and knowing what’s the root of those drops can save lots of stress for the future… Apart from Google Search Control and GA, I’d also add Nightwatch.io to the toolkit (it’s an all-in-one solution which helps me monitor SEO + SC + GA data).